CRISTINE FARINAS: So, I am going hiking!? So, I am going hiking!? 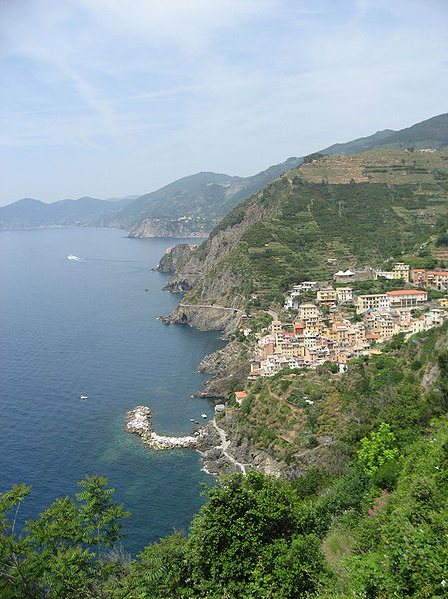 We decided to go to this place in Italy called Cinque Terre for my birthday. It already looks amazing on the photos that I have seen so far. But apparently, walking is the recommended way of exploring the beautiful villages - one that I can definitely do but not very good at. There is also a mention of about 90 minutes hike and all that. Well, my problem is I really haven't hiked in a very long time and I have no idea how will I manage it. For one, I am scared of heights and just the thought of it really makes me sick. But as I have always (wanted) to believe, the most beautiful and enjoyable things in life are sometimes the ones that I am really scared of, so sod it! I know this is gonna be worth it. Now, my other problem is what shoes to wear. I know right? Kind of stupid to be worrying about shoes but honestly, I don't have a clue what to wear. I have climbed mountains in the past in my leather shoes. Yes, in university they made us walk hills and mountains in rubber shoes with matching OB bags pa. And I successfully did that in few occasions all throughout my nursing university days. But I am not that stupid to wear leather shoes on this trip. So I have been thinking -Flipflops!!! I am most comfortable walking in my flipflops but I was told me off when I said I'd walk in my flipflops. I know you guys are thinking of proper hiking boots. I know. I know. But errr, okay, I can wear them I know but the last time I tried on one, they felt weird on my feet. Yeah, weird. Or maybe I am just not used to wearing them as I have never worn one before. But I am guessing I don't have a choice, right? Well, I will wear one if I have to. I know some of you who kindly read my blogs have had hiking experiences. Please do share, as I can do with a little bit of advice on what and what not to do/bring. Any advice would be very much appreciated. For now, I am looking forward to this trip. hahaha...you're so funny Tin! Haven't hiked for years too and Kevin and I planning to hike for some days in the German Alps with friends later this summer. I remember I still have old hiking boots at mom's house in Frankfurt, but as I said..it's been years. I am also looking for a new pair. We have a great outdoor shop here in Germany (globetrotter) where we always get our equipments for our outdoor/backpack trips. I would recommend you to go to an outdoor shop and get advised the pros. You need to try and walk with them.